To read more about this page and to see detail shots, please head over to the Simple Stories blog. Hi everyone! 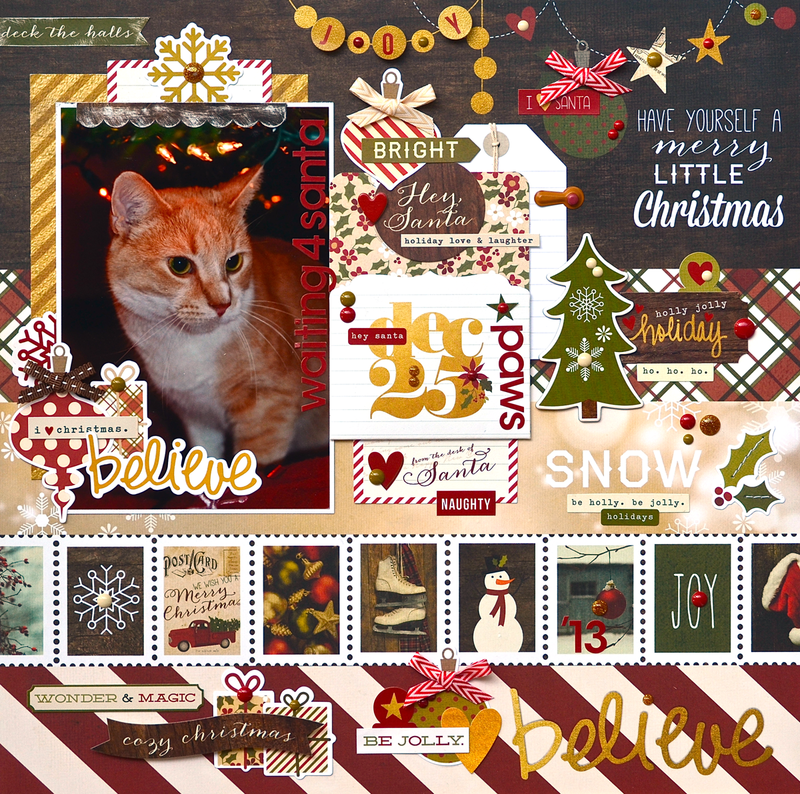 Today I'm giving you a look at a layout I made with Simple Stories new Cozy Christmas collection, courtesy of Alexa's cat, Butterscotch. He loves to take up residence under our tree. The designs in this collection run the gamut from whimsical to traditional to vintage (and I can't forget to mention the beautiful gold elements). Although it may look like I pieced together a number of different papers to create the background of this page, it's actually one piece of paper. I used a similar paper from Simple Stories Good Day Sunshine collection to create a Disney page I shared with you a few weeks ago. 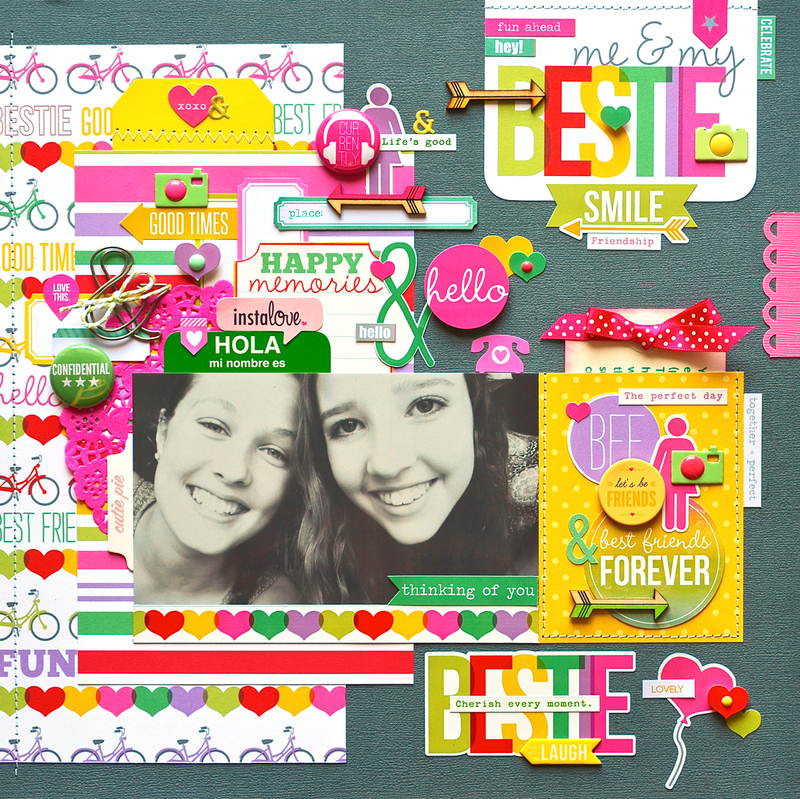 Because the background design is already done, you can use your crafting time to layer up coordinating embellishments to create clusters around the page. Maybe you'll extend an element already on the paper (like I did in the bottom row, adding on to the left of the word, "believe") or maybe you'll embellish the pre-printed garland with stickers and enamel dots. The possibilities really are endless. If you'd like more information about this page or if you'd like to see some detail shots, please visit the Simple Stories blog. See you tomorrow with another Cozy Christmas page, this time featuring a holiday craft. 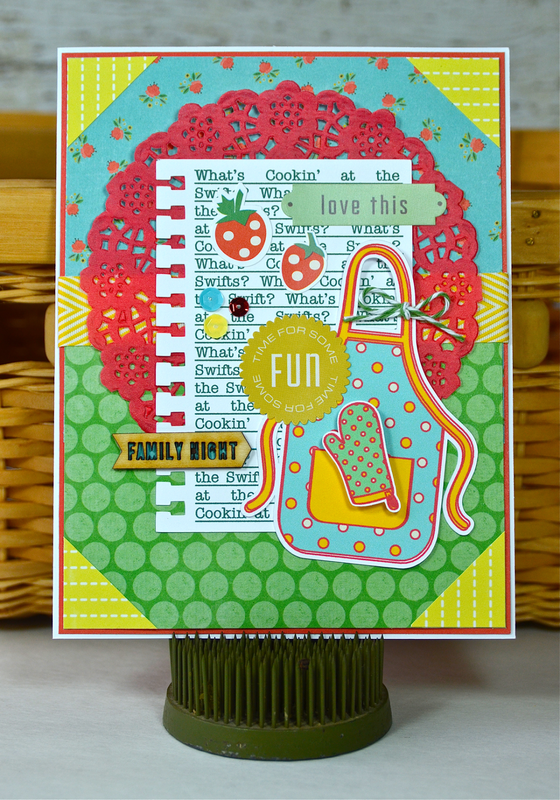 ETA: Linking up to Crafty Creations No. 24 at the Memory Nest. Hi everyone! 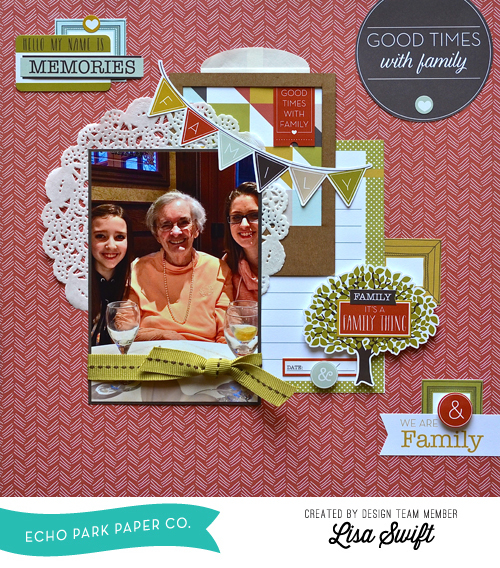 Today I'm sharing a layout made with Echo Park's new Family Reunion Mini Theme. Not only am I going to show you the finished page (above), but I'm going to take you through how it came together, from start to finish. Readers frequently ask about my layering technique and have asked for more process posts, so let's get started! Believe it or not, I don't usually have anything in particular in mind when it comes to layering. 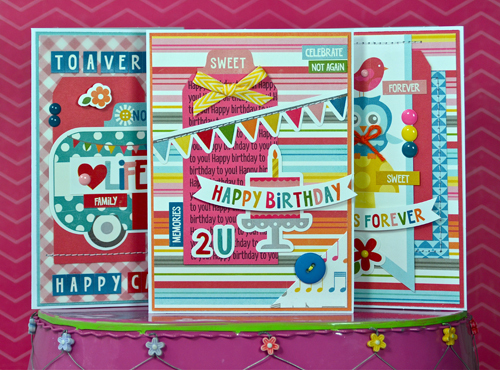 I basically just play with a mix of stickers, papers and embellishments, adhering when I'm happy with the look. Step 1: Here's a look at the foundation of the page — just a few little clusters to start it all off, made with elements cut from papers in the collection, along with some stickers. 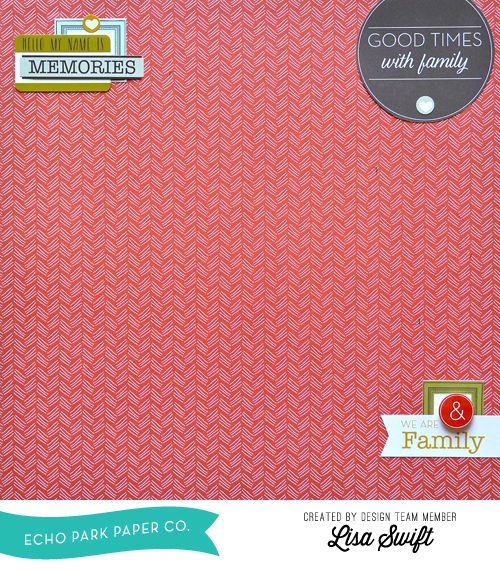 Don't feel as if you need to use patterned papers as is. 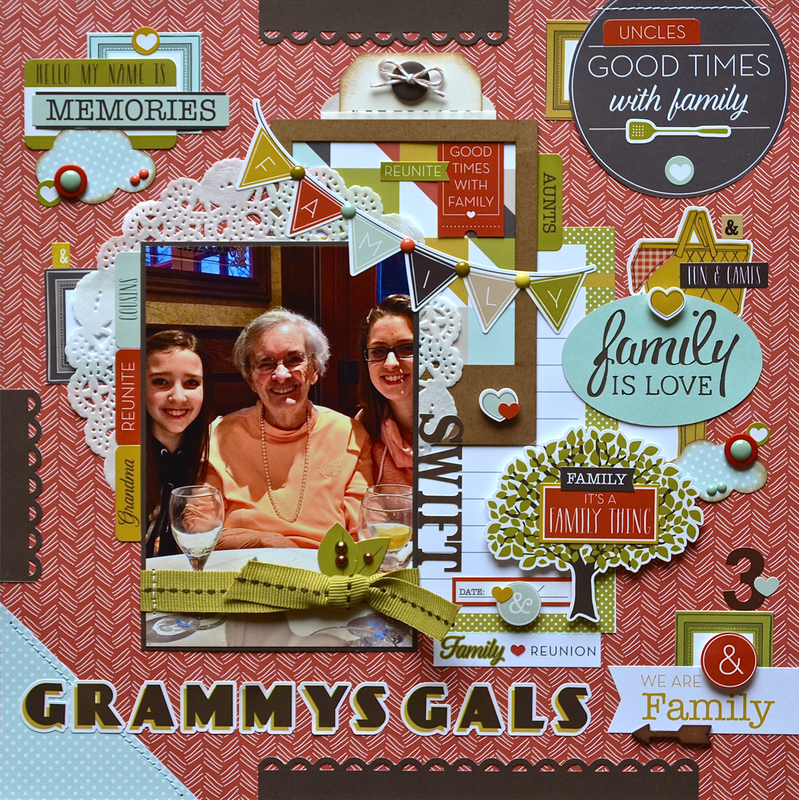 Take a good look and see what you can cut out, like the frames, banner and “Good Times with family” circle I used here. Step 2: Now it's time to start building things up. The elements I've added create a base for grounding the photo and a place to house a journaling tag (bitty bag). Step 3: Adding a bit more layering — a Polaroid-style frame highlights a second patterned paper. Because the paper is a bit busy, the frame helps to define it so it doesn't compete with the background. Step 4: Now it's time to add the photo. I backed it with a doily which helps connect the photo to the frame and reaches toward to the top left corner, tying the page together. Here's a look at the finished page again. 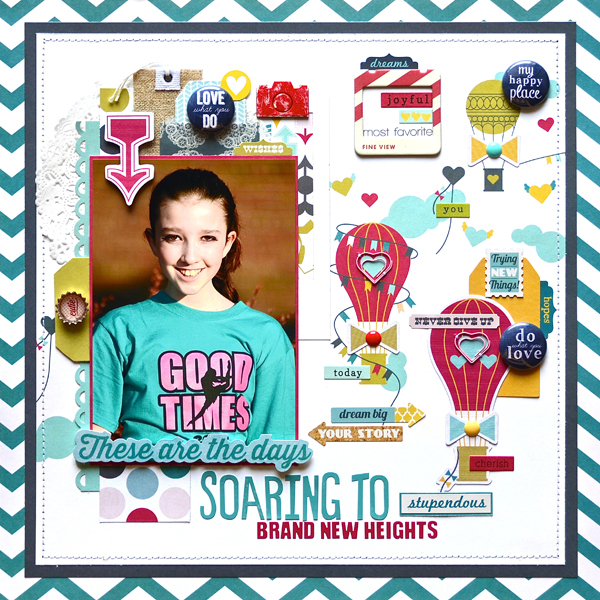 As you can see, I added the title (along with a patterned paper photo corner to help ground it), punched borders, a bit of machine stitching and a few small elements to fill spaces I felt needed a finishing touch. So there you have it. 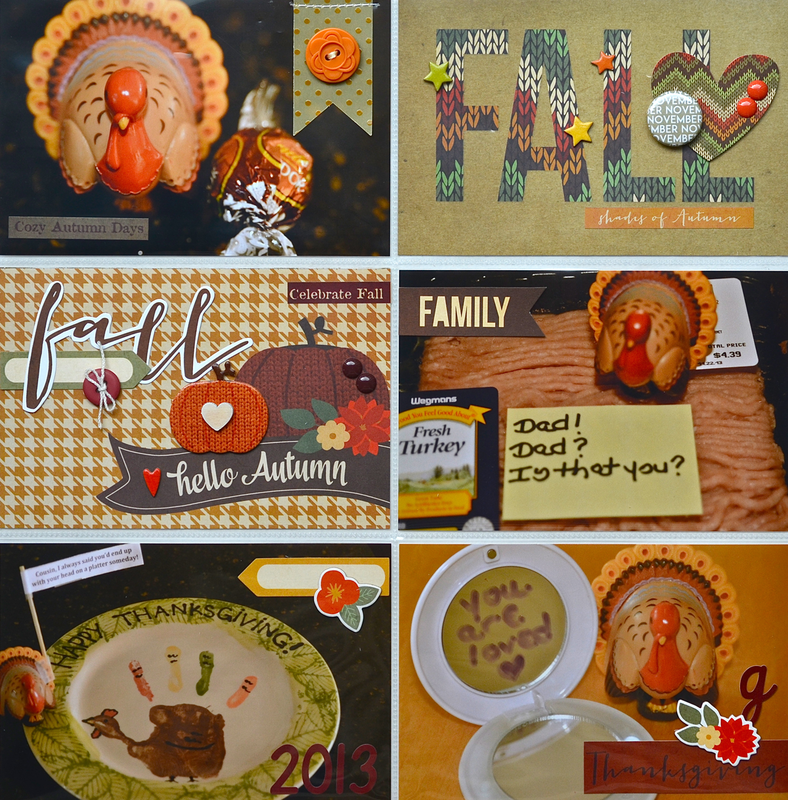 A look at my scrapbooking process. 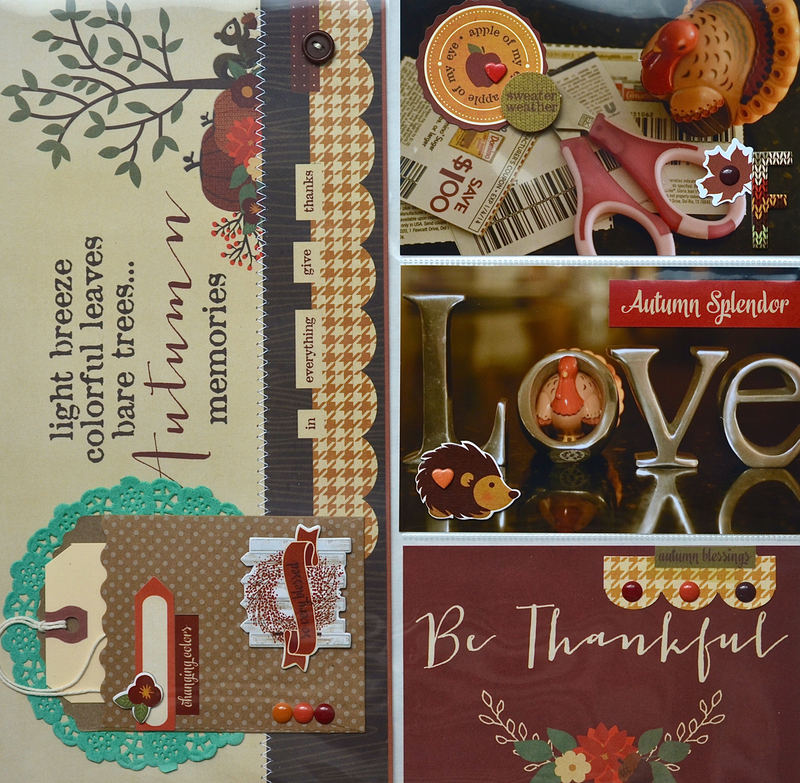 I hope you enjoyed seeing this page come together and you're inspired to give layering a try. Now is probably a good time to mention I've added a "Process Posts" tab to my blog's home page. I've listed posts that contain content about my process. I've added this page, and will add future process posts, as well. Hi everyone! I know it's a little early for Thanksgiving, but I had some catching up to do from last year. I had Simple Stories new Sweater Weather collection out for some design team assignments, so I thought I'd do a couple of pocket pages about Gallop, our Turkey on the Shelf. For those of you who have not made Gallop's acquaintance, you can read about him here or do a search for "Turkey on the Shelf" here on my blog, and you'll find the many posts I did about his 2012 escapades. I fashioned Turkey on the Shelf after the ever-popular Elf on the Shelf (which we don't do because elves freak me out, LOL). Alexa comes home from school each day to find out what kind of trouble Gallop has gotten into. Actually, he doesn't always get into trouble. As you can see from the photos below, sometimes he's very helpful and cuts coupons. Sometimes he leaves sweet or inspiring messages (even if it means stealing some of our home decor to do it). Some days Gallop leaves special treats (mmm, chocolate truffles). Other days are a bit traumatic for him, like the day he discovered his father had been turned into a package of ground turkey. I have to give my husband credit for that one, sick as it is. LOL! I also have to give Tom credit for coming up with the set up for the bottom left photo. Gallop is sitting beside a Thanksgiving platter Alexa made. He's holding a sign that says, "Cousin, I always knew you'd end up with your head on a platter someday." 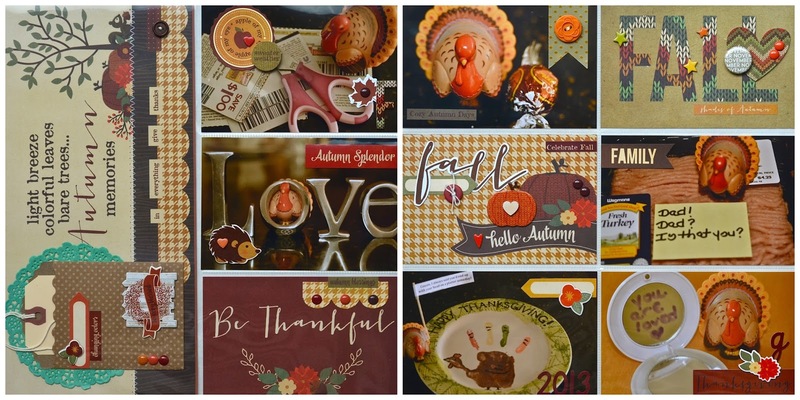 See the adorable mini "November" flair I used in the top right panel? That's from Feed My Craft on Etsy. Elise makes wonderful sets of mini flair, among other items. Be sure to check out her shop! Paper Issues August Swag Bag was revealed yesterday and it's a beauty! 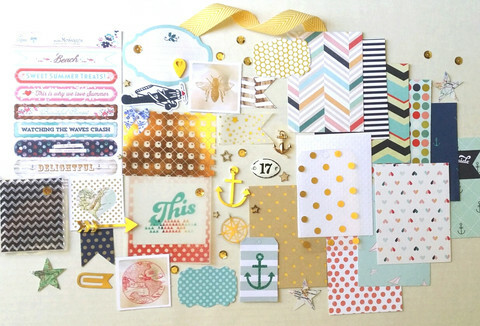 Look at that chevron stamp, the gold embellishments and the nautical elements. I love it! If you haven't already subscribed to this monthly kit, be sure to scoop one up ASAP. They sell out fast! Use the code LISA20 to get 20% off of the kit (retails for $9.99) and anything else you order. You'll find new Webster's Pages, Studio Calico and more in the store. Use tickets or other event memorabilia. Show us something about a visit to the circus, a carnival, the fair, stage show, etc. Use "Admit One" or "That's the Ticket" as a title. Hi everyone! Happy Thursday! 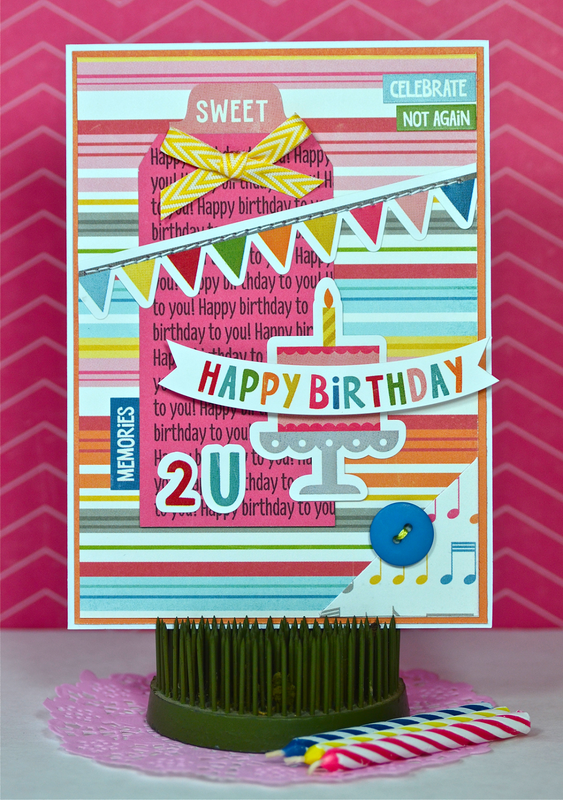 Earlier this week, I showed you a birthday card and a camping card made with Echo Park's Fine and Dandy collection. 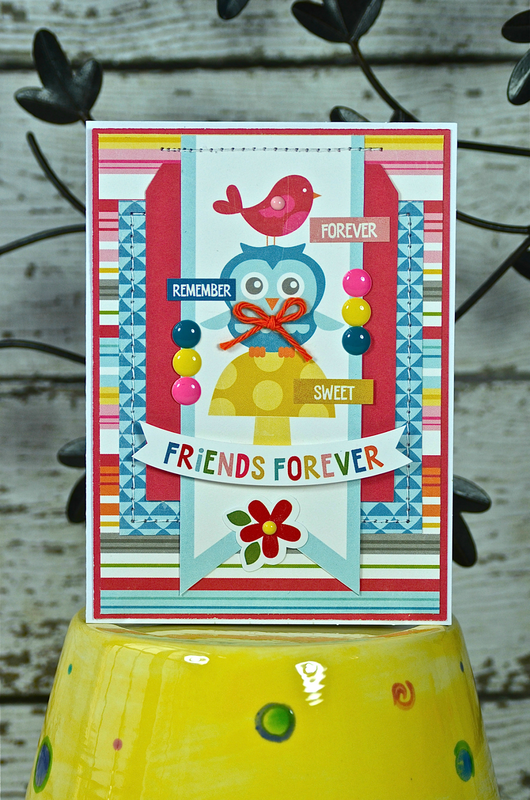 Today's card is all about friendship. How cute are the critters and mushroom on the banner? 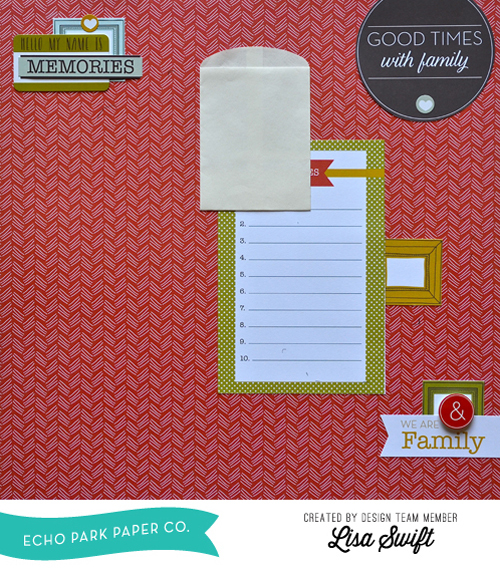 I added the Echo Park tag cut file to this card, like I did with the other two, but cut it in half and used it more like a mat or added layer. So now that you've seen all three cards, are you ready to see the simple sketch they're all based on? Feel free to pin this sketch (just hover over the image and the Pinterest icon will appear). If you use it, I'd love to see what you create! That's it from me for this week. I hope you have a great weekend! Yesterday we took a look at a birthday card made with Echo Park's Fine and Dandy collection and a simple sketch I made. 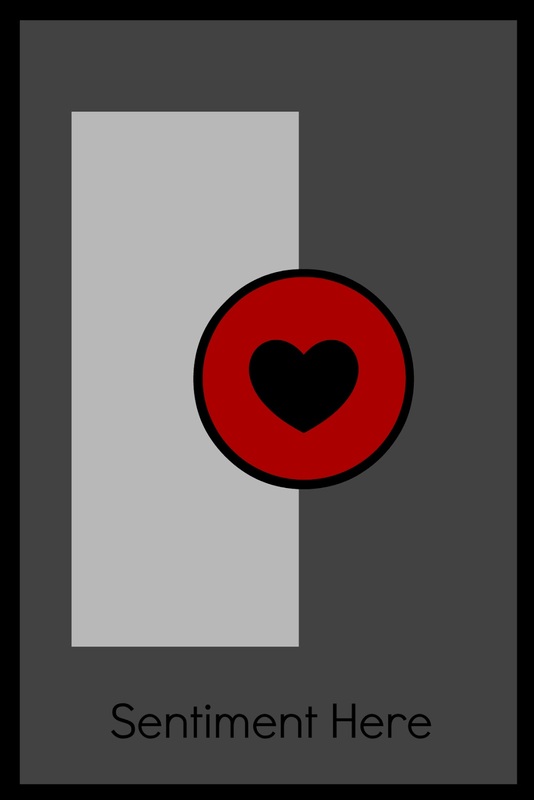 Today I'm sharing a card made with the same collection (and based on the same sketch), but with a completely different look. 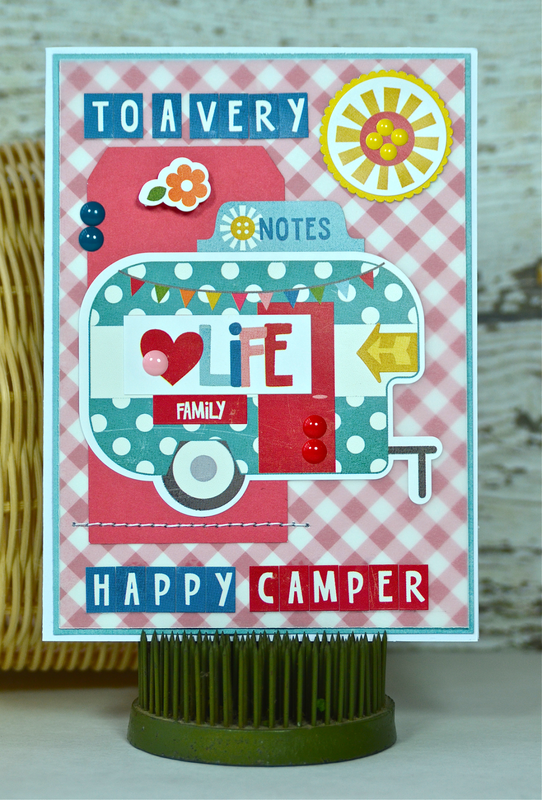 I couldn't resist pairing the cute camper sticker with the sentiment, "To a Very Happy Camper". I'm thinking this would be perfect to send to a child who's gone off to summer camp (or someone who's obsessed with adorable campers/glampers). I used the same tag (Echo Park Silhouette cut file) found on the birthday card, this time leaving it blank. I didn't want to compete with the camper or the background paper. Instead, I used the tag to ground the camper sticker. I also added a layer of vellum over the background paper so the sticker elements would stand out. I'll be back tomorrow with one more card to share, along with the sketch I mentioned earlier. See you then! What does an almost 13 year old do while hanging out with her best friends before heading out for her birthday dinner? Take selfies, of course (and then edit them with her current favorite app — which is Retrica by the way)! Echo Park's Best Friends Forever Mini Theme worked perfectly for this photo. I love how fun and happy this collection is. So perfect for girlfriend selfies! I tried a number of different background colors (OK, more like obsessed over a number of different background colors) before going with gray. Of all of the colors I tried, the gray allowed all of the colors in this collection to pop and shine. I started with hot pink but it was too bright. Purple, yellow and light green didn't wow me either. Believe it or not, I've never used gray as a background before (and yes, there is gray in this collection, although it's hard to tell). I guess I should consider it as an alternative neutral from now on. A new linky party, called Mix Tape, has started at Paper Issues. 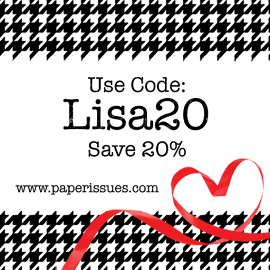 Hazel & Ruby is our fabulous sponsor and they've given us a goodie bag of their products to give away. 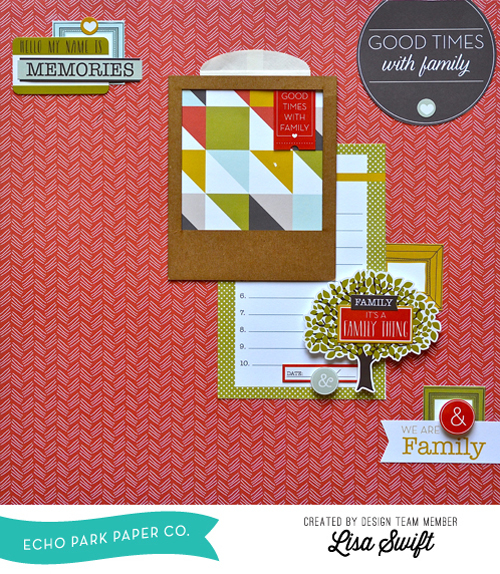 There are all sorts of projects you can link up to this theme, so be sure to check the blog for a list of ideas and to see the wonderful projects the design team made with Hazel & Ruby's washi tapes. Use a "mix" of products from a variety of manufacturers or mix and match collections from one company. Reminisce a bit about music media gone by like cassette tapes, 8-track tapes and 45s. What is your favorite song or favorite type of music? Bring back the days of disco by using sequins on your page to replicate the sparkle of a disco ball. Use Hazel & Ruby products. I hope to see some of my blogging friends linking up to this one!